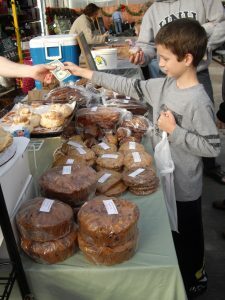 One of the great things about farmer’s markets is that the whole family can participate and have fun. With all the different stands containing colorful fruits and veggies, music, or arts and crafts, its enough to make for a great outing for all! Here are 5 reasons why going to the farmer’s market with the family is a great day trip. 1. An interactive learning experience for the kids: Walking into the farmers market has lots of learning opportunities for kids. They can walk around and see all of the bright colors, meet the different vendors and talk with them (if they are old enough) about the different kinds of foods and where they come from, learn more about farm-to-table, and see all of the other people and families. They may be able to do crafts or talk with vendors about how they made their art like jewelry, paintings, wool yarn, etc. They may also get the chance to watch and enjoy some local live music! 2. A fun activity for the family to enjoy together: Going to the grocery store with kids can become overwhelming quickly when there isn’t a lot for them to do. The farmers market has a lot of action and things to look at, and people there are usually with their families so they can appreciate other little shoppers. It is lighter and brighter shopping outside and it changes the whole approach to shopping and cooking with the little ones when they can be involved and entertained. 3. Local food can create a smaller carbon footprint: You can talk with the farmer about how the food is grown and when all the different foods that are in-season, as well as enjoy the freshness to boot! Having it grown locally reduces the carbon footprint by reducing the miles and gas it takes to get to your plate. 4. Supports healthier, more sustainable growing practices: You can trust food coming from a farmers market. Yeah, sometimes the grocery store may feature a few items from local farms, but being a mom, its nice to be able to trust that everything is grown sustainably, the meat is humanely raised, and my kids are growing healthier and stronger because of that. 5. The power of choice: When it comes to food kids definitely have their own opinions! One way to get them to try new things is to have them pick out their own produce. Let them pick out one item to try at a time. That may be the best option because if they take a few bites and don’t want it anymore, it goes to mom and dad and there isn’t as much waste. When you’re shopping with kids it is also nice to keep some things in mind to create a better experience. Reduce your carbon footprint further and bring your reusable shopping bags. Most stands will take cards, but you can help your kids do math by bringing ones or fives since most produce are at even price-points. Bring or buy a snack or treat while your there if possible so that the kids can taste the food while they are there and associate it better. Also try to go to the farmers market often if possible to create and keep good habits. Sofia’s Post: What is Tatsoi?